The right software can allow connectivity to be be smarter. How many of the things in your house do you think are connected? The answer will undoubtedly be more than you expect. It is not just the smartphone in your pocket, or the tablet on your desk, but increasingly the smart TV in your living room, the wireless speaker in your kitchen, the games console in your child’s bedroom and now with more cars connected to mobile networks than phones, inevitably the car parked on the drive way. The term that has become ubiquitous with these devices is that they are “smart”, but what exactly is it that makes them “smart”? In order to be smart, these items generally need to incorporate some element of artificial intelligence (AI). With AI they are able to operate interactively and autonomously to a greater or lesser extent. These intelligent, connected devices are all enhanced by software, which helps them to make all our lives so much easier. Consumer technology has a lot to answer for, but in a good way. The emergence of smart devices, such as the iPhones of today and the BlackBerry handsets of yesterday, has revolutionised the way we all do business. Put simply, they have given users a renewed appreciation of connectivity. While many of us still remember the days of dial-up when you could make a cup of tea while waiting for an image to download, today we are all guilty of taking connectivity for granted and only really think about it when it is not working. This has permeated into the business world too and employees now expect to be able to access their emails, work remotely and use various systems and software to make them more efficient, all with speed and complete availability, wherever they are. As a result, connectivity is fundamental to the survival of any modern-day organisation. So why shouldn’t we start making our business connectivity smarter, as well? Why can’t we apply the “smart” lesson that consumer technology is teaching us? Is it time to look beyond the confines of leased lines and traditional carriers? It is no exaggeration to say that good internet connectivity is critical for every business, regardless of what industry they are in. In the past, connectivity was more important for businesses with a strong e-commerce focus or those that relied on it to reach customers. Now, however, everybody needs it. It is crucial to reach those customers, sell products, connect remote teams together, and give staff access to company apps and systems. Gartner recently estimated that the average cost of IT downtime to businesses is a staggering £258,000 per hour. It is not just the immediate loss of revenue that has the potential to hurt your business, but the additional damage to your company’s reputation for delivering value. There have been some changes to organisational requirements over the last few years. There is now an increased need for high performing, high capacity and low latency connections that will effectively deliver data, voice and even video instantly to where it is needed. For organisations and IT managers it is an ongoing challenge to make sure that the business is properly supported. Enter multi-line aggregated connectivity. Initially seen as a stop-gap technology, aggregated connectivity takes traditional broadband circuits, such as ADSL or fibre to the cabinet (FTTC), and, when necessary and available, Ethernet circuits, including fibre to the premises (FTTP), and brings them together as a single virtual connection. Multi-line aggregated connectivity is no longer seen a stop-gap technology. It delivers real benefits to organisations of all sizes. Bonded ADSL can offer increased bandwidth and capacity, normally impossible with individual ADSL lines, enhancing data throughput speeds and application performance, and built-in resilience. This is ideal for businesses with sites in poorly served geographic areas and substantial bandwidth requirements. In the same vein, it is also ideal for companies that need a more cost-effective connection than leased lines. Simply put, the more lines the aggregated connection includes, the lower the chance of all of them failing at once. This built-in resilience is further enhanced by bonding diverse connection types. It is here that software can play a role in making business connectivity smarter. As well as aggregating multiple lines, the software overlay technology also brings other benefits and can in fact solve issues to increase the quality of the connection. By extension, it can improve the quality of the user experience and help to protect organisational reputation. Connectivity and performance are also monitored to ensure that any issues are picked up quickly, but it also means that when it comes to resilience there will be seamless failover if one of the lines goes down. With a normal, single line sourced from one ISP, if it goes down, the entire business experiences downtime. It is the ultimate data traffic jam. Not so with aggregated connectivity; in this case, your data will get re-routed around the issue to ensure maximum uptime. The “smart” software plays a vital role in prioritising traffic; ensuring that latency sensitive voice traffic is given precedence over other data. For businesses with high download requirements this means never dropping a VoIP call when an employee elsewhere is downloading a large file. It can also be used to prioritise other packets of data, such as those needed to view content heavy web pages, so that sites load that much faster, giving a better, high quality browsing experience. The software overlay model can be extended even further, delivering on the promise of SD-WAN, which is ideal for multi-site businesses, connecting users, offices and different sites. It is far more flexible, more cost effective and more resilient than MPLS and provides stable low latency connections that are much quicker to deploy than traditional leased lines. In today’s environment of software-defined everything, why not connectivity? 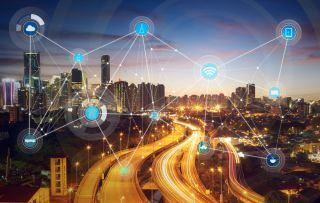 Whether it is a single site or a multi-location business, connectivity can stand to benefit from the use of software to make it smarter, more resilient and deliver better quality across the whole business.